Performance counters in Windows and Linux provide insight into the performance of hardware components, operating systems, and applications. Azure Monitor can collect performance counters at frequent intervals for Near Real Time (NRT) analysis in addition to aggregating performance data for longer term analysis and reporting. Configure Performance counters from the Data menu in Advanced Settings. When you first configure Windows or Linux Performance counters for a new workspace, you are given the option to quickly create several common counters. They are listed with a checkbox next to each. Ensure that any counters you want to initially create are checked and then click Add the selected performance counters. 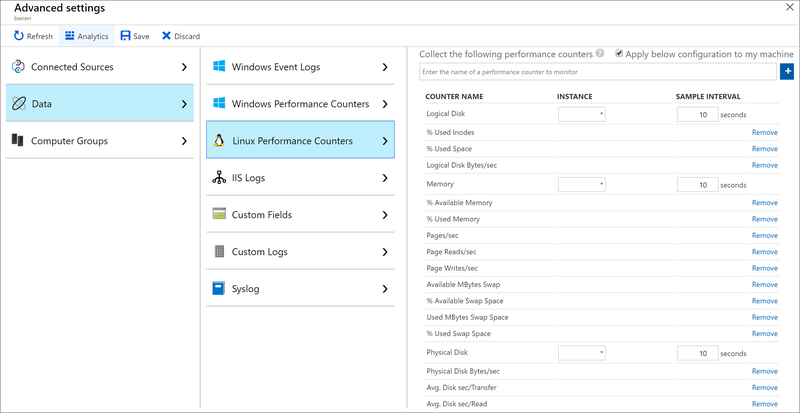 For Windows performance counters, you can choose a specific instance for each performance counter. For Linux performance counters, the instance of each counter that you choose applies to all child counters of the parent counter. The following table shows the common instances available to both Linux and Windows performance counters. Follow this procedure to add a new Windows performance counter to collect. Type the name of the counter in the text box in the format object(instance)\counter. When you start typing, you are presented with a matching list of common counters. You can either select a counter from the list or type in one of your own. You can also return all instances for a particular counter by specifying object\counter. When collecting SQL Server performance counters from named instances, all named instance counters start with MSSQL$ and followed by the name of the instance. For example, to collect the Log Cache Hit Ratio counter for all databases from the Database performance object for named SQL instance INST2, specify MSSQL$INST2:Databases(*)\Log Cache Hit Ratio. Click + or press Enter to add the counter to the list. When you add a counter, it uses the default of 10 seconds for its Sample Interval. You can change this to a higher value of up to 1800 seconds (30 minutes) if you want to reduce the storage requirements of the collected performance data. When you're done adding counters, click the Save button at the top of the screen to save the configuration. Follow this procedure to add a new Linux performance counter to collect. By default, all configuration changes are automatically pushed to all agents. For Linux agents, a configuration file is sent to the Fluentd data collector. If you wish to modify this file manually on each Linux agent, then uncheck the box Apply below configuration to my Linux machines and follow the guidance below. Type the name of the counter in the text box in the format object(instance)\counter. When you start typing, you are presented with a matching list of common counters. You can either select a counter from the list or type in one of your own. Click + or press Enter to add the counter to the list of other counters for the object. All counters for an object use the same Sample Interval. The default is 10 seconds. You change this to a higher value of up to 1800 seconds (30 minutes) if you want to reduce the storage requirements of the collected performance data. Instead of configuring Linux performance counters using the Azure portal, you have the option of editing configuration files on the Linux agent. Performance metrics to collect are controlled by the configuration in /etc/opt/microsoft/omsagent/<workspace id>/conf/omsagent.conf. Each object, or category, of performance metrics to collect should be defined in the configuration file as a single <source> element. The syntax follows the pattern below. The parameters in this element are described in the following table. object_name Object name for the collection. instance_regex A regular expression defining which instances to collect. The value: . * specifies all instances. To collect processor metrics for only the _Total instance, you could specify _Total. To collect process metrics for only the crond or sshd instances, you could specify: (crond\|sshd). interval Frequency at which the object's counters are collected. The following table lists the objects and counters that you can specify in the configuration file. 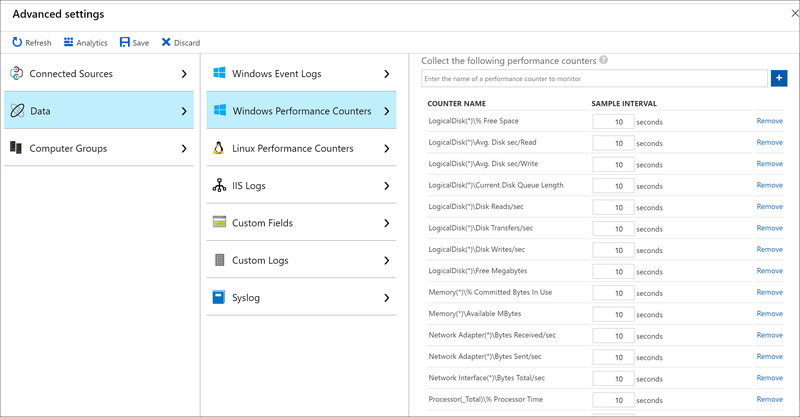 There are additional counters available for certain applications as described in Collect performance counters for Linux applications in Azure Monitor. Following is the default configuration for performance metrics. Azure Monitor collects all specified performance counters at their specified sample interval on all agents that have that counter installed. The data is not aggregated, and the raw data is available in all log query views for the duration specified by your subscription. Performance records have a type of Perf and have the properties in the following table. CounterPath Full path of the counter in the form \\<Computer>\object(instance)\counter. CounterValue Numeric value of the counter. InstanceName Name of the event instance. Empty if no instance. SourceSystem Type of agent the data was collected from. TimeGenerated Date and time the data was sampled. A rough estimate for collection of a particular counter at 10-second intervals is about 1 MB per day per instance. You can estimate the storage requirements of a particular counter with the following formula. The following table provides different examples of log queries that retrieve Performance records. Perf | where ObjectName == "MSSQL$INST2:Databases" and InstanceName == "master" All Performance data from the Database performance object for the master database from the named SQL Server instance INST2. Collect performance counters from Linux applications including MySQL and Apache HTTP Server. Export collected data to Power BI for additional visualizations and analysis.